Does deregistration short cut conflict with Court judgment? ASIC, Forms, Insolvency Laws, Regulation Comments Off on Does deregistration short cut conflict with Court judgment? A controversial ASIC-approved short cut to deregistration in a creditors’ voluntary liquidation seems to be at odds with sentiments expressed in a decision of the Federal Court of Australia. In my post headed “Obscure short cut through insolvency law on company deregistration” (24/11/2010) I questioned whether this officially sanctioned short cut or escape mechanism – which allows liquidators to bypass sections 509(1) to (5) of the Corporations Act 2001 (the Act) in loosely defined and very common circumstances – was warranted. Now it stikes me that it might actually be unlawful. His Honour, Jacobsen J, examined section 509 of the Act in considering the case of Emergen X Pty Ltd (In Liquidation) ACN 114 579 510  FCA 487. His Honour’s written judgment (May 2010) illustrates the importance attached to the requirements to convene a final meeting and to let 3 months elapse after that date. I find it difficult to see how the sentiments expressed by His Honour sit in harmony with the short cut – as ASIC has approved with companies Form 578 – which allows liquidators to bypass giving notice of a final meeting of creditors and also removes the 3 month period of grace. “The reason why there is a period of grace of three months allowed after the filing of the return seems to be explained in a Victorian authority from the nineteenth century. The decision, which is relevant, is John Birch & Co. Limited v The Patent Cork Asphalt Co. Limited (1894) 20 VLR 471 (“John Birch”). In that case Madden CJ said at 472 that the suspension of a dissolution for three months in the then relevant section of the legislation means that a purpose is to be served. His Honour said the only easily understandable purpose is to enable persons who are affected to come in and make a claim. Thus the period of grace is allowed for claims by creditors or other aggrieved parties so as to ensure that they can make a claim against a company without having to go through the process of seeking an order reinstating it. Note: For the full text of this judgment, issued in May 2010, click HERE. Here’s a tip for the student of insolvency law and practice. Don’t look to legislation or legal judgments for all the answers. Some of the official rules are contained in “regulatory guides” which can easily escape your attention. But even more problematic is the occasional, obscure, almost unwritten, rule which is the result of a pragmatic arrangement between regulators and insolvency practitioners. A good, current example , is deregistration of a company following a creditors’ voluntary liquidation. Here, the pragmatic twist to the law dwells in the text on a non-prescribed form, and in the text of an even more obscure document, a statement issued by the Insolvency Practitioners Association of Australia (IPAA or IPA) to its members. Look up Part 5.5 of the Corporations Act 2001 (the Act), under the heading “Final meeting and deregistration”, and you will find law (section 509) which states that “ASIC must deregister the company at the end of the 3 month period after the (final) return was lodged.” This requirement is sometimes referred to as “automatic deregistration”. To get to this point in a creditors’ voluntary liquidation where the liquidator lodges a final return, the Act states that the liquidator “must convene a general meeting of the company, or, in the case of a creditors’ voluntary liquidation, a meeting of the creditors and members of the company, for the purpose of laying before it the account and giving any explanation of the account” . On the face of it, these provisions would appear to be the law. Put simply, a company which has entered into a creditors’ voluntary liquidation is deregistered automatically 3 months after the liquidator’s return of the final meeting is lodged. If you, the student, wanted this confirmed, you might consult a book on corporate insolvency law in Australia, where you would almost definitely find such confirmation. But what you and the author of the book (and, of course, creditors and the general public) don’t know is that ASIC has modified the law. How? Well not – as far as I can see – through the official process of issuing a regulatory document, such as a Regulatory Guide or Information Sheet (of which there are a great many). So, dear student, the “law” relating to deregistration of a company following a creditors’ voluntary liquidation has been modified by inserting an escape clause. If there are no funds left in the liquidation and the affairs of the company are “fully wound up”, the requirement to hold a final meeting is nullified or overlooked, and deregistration can be achieved by simply ticking a box and lodging a form. Personally, and like most people, I am strongly opposed to obscure or unwritten rules in any area of law, and especially so when they come into being with little debate and are at odds with the principle or intention of the law as it is expressed in applicable legislation. 1. Liquidators receive a benefit, particularly when they are winding up a company that does not have enough funds to pay the costs of calling a final meeting of members and creditors. Without this short cut to deregistration these liquidators would be out of pocket. However, the saving in each case may not be great, given that there is (apparently) no requirement to give notice of the final meeting other than by means of one advertisement in the Government Gazette. 2. The government regulator (ASIC) receives a benefit by getting more dead companies off its Register with less “fuss”, thus reducing its workload in this area and thereby saving taxpayers some government expenditure. But what of the creditors of the company in liquidation? Financially, the Form 578 short cut to deregistration appears to make no difference to the creditors, for if the company is able to pay them a dividend the procedure cannot be utilized; and if the company is unable to pay them a dividend, it remains unable to pay them a dividend. From the intangible views of justice and equity, it can be seen that, in the case of creditors of a company which is unable to pay a dividend, the Form 578 short cut deprives creditors of the right to receive a final account of the winding up and the opportunity to discuss the winding up with the liquidator and others at a final meeting. Apart from the fact that these rights and opportunities seem to be enshrined in sections 509(1), the short cut method overlooks one of the main themes of recent attempts to reform insolvency laws, namely the need to improve information to creditors. Is this short cut justified by the financial savings and improved efficiency? Let’s have a debate. 89% of the initial offence referral reports sent to Australia’s corporate regulator by liquidators and other external administrators end up consigned to oblivion. Of the remaining 11%, approximately 66% receive a similar fate. This data is revealed in the latest annual report by the Australian Securities and Investments Commission (ASIC), tabled in Parliament on 28 October 2010. Unfortunately ASIC’s annual report does not offer any explanation for the result, which is that the vast majority of offence allegations are dropped or rejected. It would be instructive to know, for example, whether a lot of statutory reports of “misconduct and suspicious activity” are badly prepared, inadequate or unjustified; and/or whether ASIC regards a lot of the alleged misconduct and offences as minor or trivial. In the 2009/10 financial year ASIC received 9,074 reports from liquidators, administrators and receivers (external administrators). Of these 6,509 (71.7%) contained allegations of “misconduct or suspicious activity”. Normally ASIC does not act upon an external administrator’s allegations of misconduct or suspicious activity unless the allegations are supported by a detailed report by the external administrator. ASIC refers to this detailed report as a supplementary report, since typically it supplements or expands upon an initial report by the external administrator. Usually a supplementary report is put together at the request of ASIC. 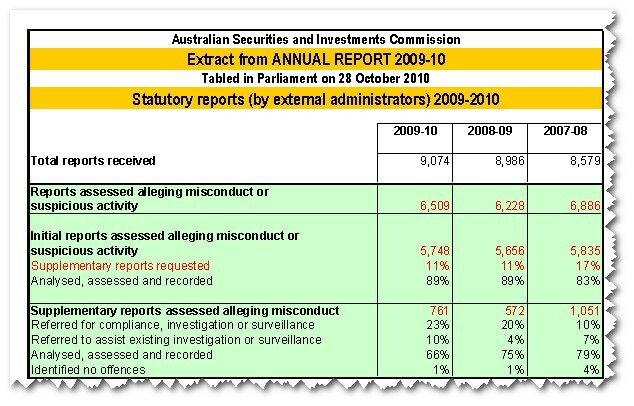 In 2009/10 ASIC received 5,748 initial reports alleging misconduct or suspicious activity. Presumably all of these were “analysed and assessed”. Out of these 5,748 reports ASIC selected 11% (632) as worthy of further attention by way of a supplementary report. The end result for the other 89% of initial reports (5,116) was to be “recorded”. This probably means that nothing worth mentioning was done about them. The same fate befell 66% of the 761 supplementary reports alleging misconduct or suspicious activity. Of the other 34%, ASIC referred 23% (175) “for compliance, investigation or surveillance” and referred 10% (76) “to assist existing investigation or surveillance”. ASIC concluded that 1% of the reports (8) did not actually identify offences. There is no data in the chart on how many reports by external administrators led to prosecutions for offences. John Adams, a well-known Melbourne liquidator, passed away on 31 October 2010 at the age of 66. In the years that I knew him well (1979 to 1984) John was a knowledgable and respected liquidator with a professional approach combined with loads of business nous and common sense. Just as importantly he was also warm, generous and a lot of fun to be around. I will be forever grateful to him for having faith in me and giving me a start in public accounting and the insolvency profession when he was a partner at Parkhill Lithgow and Gibson, Chartered Accountants.